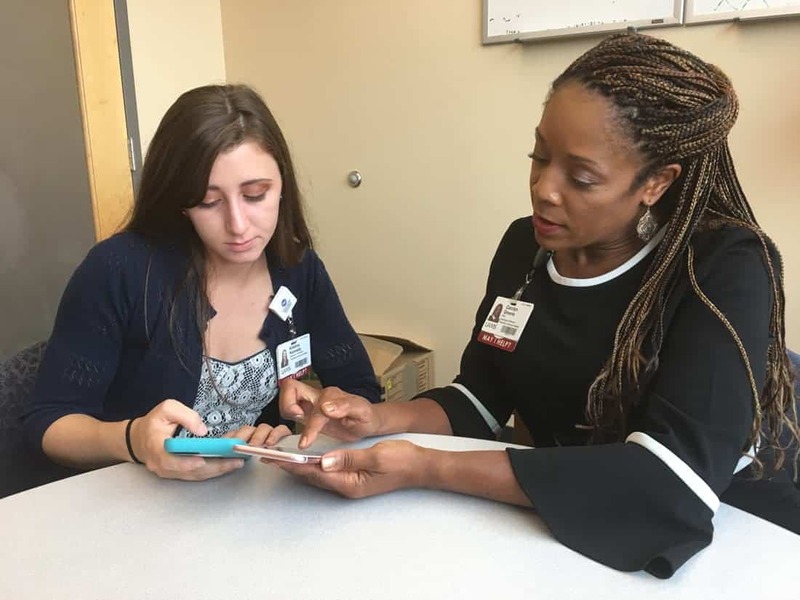 Carolyn Greene, Ph.D., (right) looks over mobile apps for depression and anxiety with research technician Kristina Kennedy. Greene is studying ways to improve them. July 18, 2018 | July 18, 2018 | A UAMS researcher is exploring ways coaching and other additions might improve a suite of apps that aims to help patients with depression and anxiety. Greene is a nationally recognized expert and innovator in the use of technology to increase access to high-quality mental health care. Her study, which is funded by the National Institutes of Health, is on the IntelliCare suite of mobile apps, which uses interactive design and tasks to lead patients through cognitive behavioral therapy exercises that address symptoms of depression and anxiety. The My Mantra app uses simple phrases and images to encourage positive thinking. Cognitive behavioral therapy (CBT) is one of the most well-established forms of mental health treatment. It aims to improve mood and outlook by working with patients to re-examine and modify behaviors and reactions to emotions and thoughts. It uses tools that are typically targeted at specific goals over a short period of time. The apps were developed by a research team at Northwestern University. In a field trial, participants using the apps experienced substantial reductions in depression and anxiety. However, the apps are not intended to replace in-person therapy. Rather, they can augment or reduce barriers to care. Greene thinks these types of technologies can serve as a powerful way to reach people who have previously not been able to take advantage of advancements in mental health care. Greene said there is a growing interest in technology-based mental health care. The IntelliCare suite is unique in that it is built on evidence-based principals, the apps have gone through field trials that showed their effectiveness and they are free. In her NIH study, Greene aims to gather feedback from stakeholders to improve app functionality, develop a plan for implementing the apps’ use in primary care settings, and conduct a clinical trial to determine if follow-up contact with the patient from a coach would make it even more effective for patients. Greene is looking for feedback from primary care physicians, patients and other stakeholders and is recruiting patients from Arkansas for the clinical trial. She will be using focus groups, structured interviews, questionnaires and other techniques. Worry Knot – Teaches skills for decreasing emotional response to worry and anxious thoughts and how to release from tangled thinking. Thought Challenger – Helps patients improve mood and decrease anxiety by teaching them to recognize and change unhelpful thought patterns. My Mantra – Uses simple phrases and images to encourage positive thinking and gratitude. Daily Feats – Helps patients stay engaged in life, set goals and celebrate accomplishments, which can increase motivation and improve mood. Day to Day – Provides lessons and daily tasks related to a variety of cognitive behavioral therapy concepts. Patients learn about a new skill a week for five weeks and practice the skill with daily messages and tasks. For more information visit www.JoinIntelliCare.com or email mobileapps@uams.edu. Greene works is the Division of Health Services Research, where many of the studies are looking for ways to harness technology, telemedicine, apps and wearables to improve health care in practical, real-world ways. Division Director Teresa Hudson, Pharm.D., Ph.D., has described health services research as “where the rubber meets the road.” Examples include everything from computer-aided CBT for veterans to using iPads and wearable heart monitors to track patients with high-risk pregnancies from home. In Greene’s previous position at the National Center for Post-Traumatic Stress Disorder (PTSD), she directed the first rigorous clinical trial establishing that telehealth is as effective as face-to-face group therapy and was on a team who produced Department of Veterans Affairs’ first mental health mobile app, PTSD Coach.